Hi friends! Do I have something fun for you today! As we all know, Valentine's Day is coming up pretty fast. So, when Personal Creations asked if I could share some tips on how to make this Valentine's Day special for their Valentine's Day Dating Guide, I was all in! I thought about lovey recipes...things one could make for their significant other. I thought about chocolate things...chocolate dipped things...heart shaped cookies....red velvet cakes and the like...and honestly...wasn't feeling it. Oooops! Plus, let's be honest: one second on Pinterest and you'll for sure fill up all your Valentine's Day recipe needs in about 2 seconds. Which is awesome! So what could I contribute? Then I thought about how some of may readers my not have a significant other or might not really feel like cooking something. I'd hate to exclude them. So here is a post guaranteed to make anyone happy- let's learn how to make some cute (and ridiculously easy) edible decorations for either handmade or store-bought treats! How easy would it be to go buy a few dozen store bought cupcakes, and then make these edible decs? Answer: Too easy. Then simply pass out to friends, co-workers, a child's class, or your own family at home. Boom. You're a Valentine's Day genius. 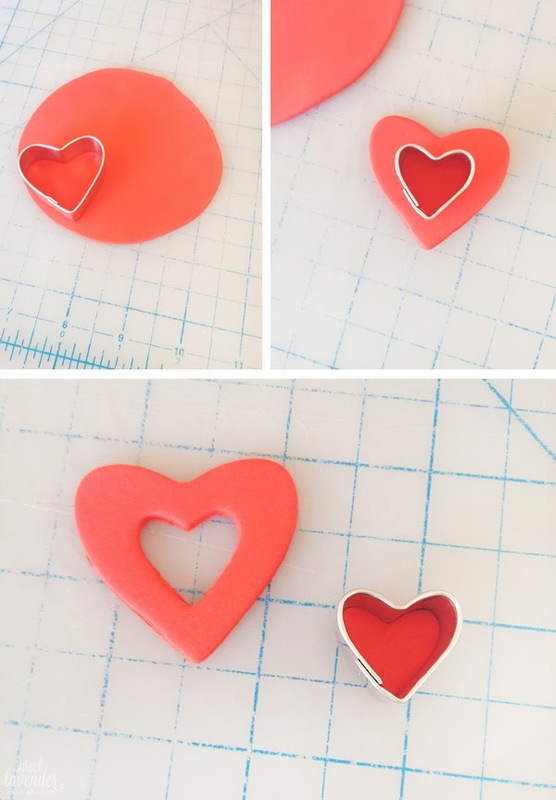 All it takes is a few simple items and about a half hour and you're on your way to Valentine's Day fun! A few drops of red GEL food coloring. I love using AmeriColor. Please do not use liquid food colorings for this. 1. With gloves on, thoroughly mix in a few drops of your food coloring into your gum paste/fondant. Mix really well before adding more coloring. Depending on the size of your ball, your amount of coloring will vary. Make sure to keep any and all unused fondant covered in plastic wrap! 2. 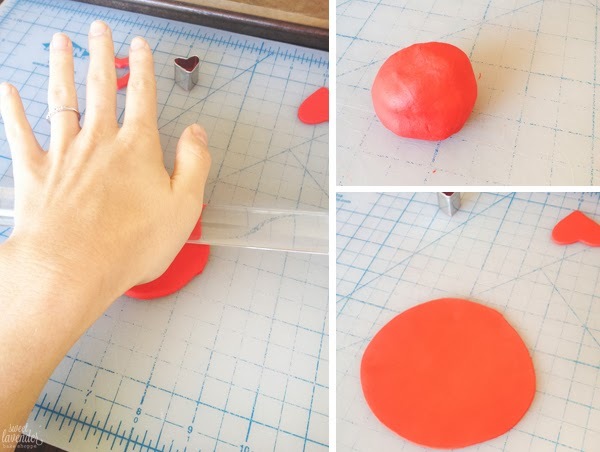 Roll out your ball so that it is about 1/8" to 1/4" thick. 3. 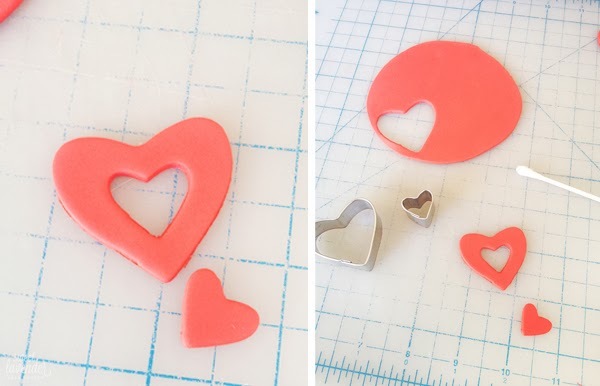 With your larger cutter, cut out as many hearts as you need! 4. With the smaller cutter, cut out the very center of your larger heart. 5. 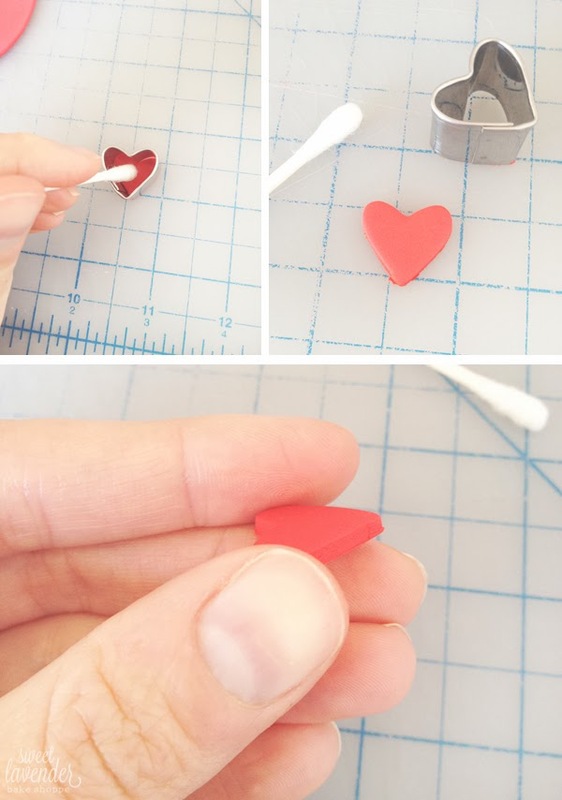 For smaller shapes like the small heart, it works best if you gently press out with a soft Q-Tip. 6. Gently rub the edges of all of your hearts to eliminate any rough sides. 7. Place all hearts on a wax or tin foil lined sheet pan and allow to dry at least 4 hours. Flip over and allow other side to dry and harden as well. 8. 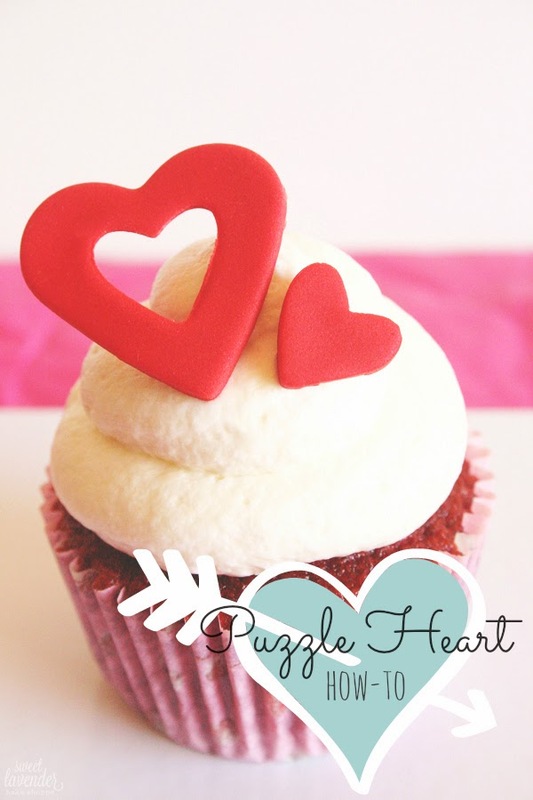 Once hardened, simply place right on top of frosted cupcakes or cakes! Ok ok, I can't resist. 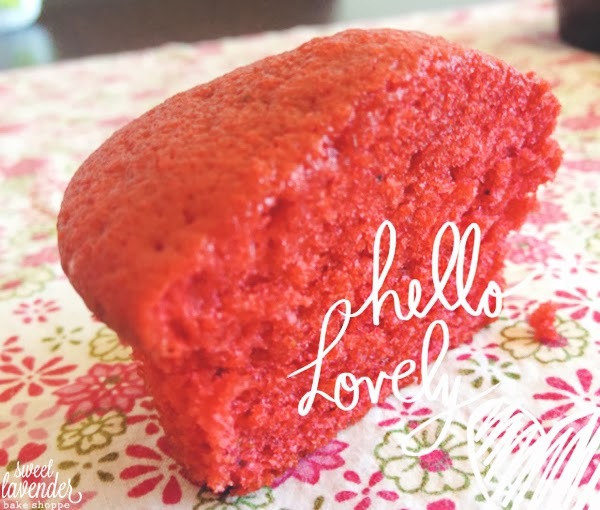 If you need a great red velvet recipe, because you want to make your Valentine's Day THAT much sweeter, here is an amazing one! How cute will you be showing up at your friends' and loved ones' houses with a little gem like this? Or, if you are making a dinner at home for your significant other, a few of these babies will for SURE score you some awesome points! Oh! And including this Spooning Print or this Half a Heart Square Mug Set with your names on it wouldn't hurt either! *Thank you Personal Creations. All pictures and opinions here are strictly my own. This is so cute! Thanks for sharing, I might need to make a batch of cupcakes for a special Valentine's treat for my daughter! yummmmy! 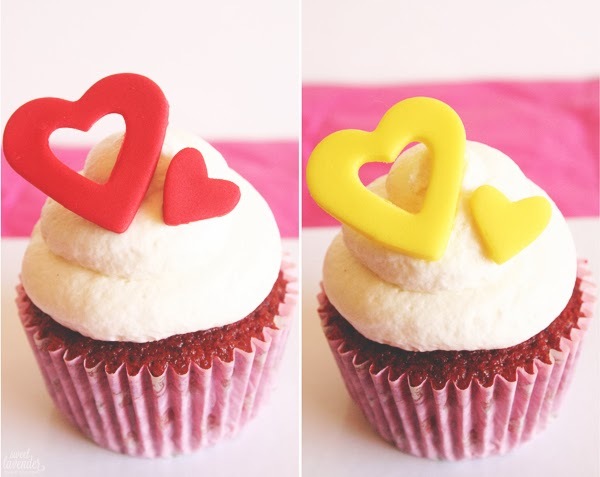 i love baking cupcakes...or anything, really, and these are adorable!